It has been quiet. And mellow. And nice. I’ve enjoyed my little guy. He’s a sweet little lover boy and has been generous in demonstrating his affection. But I’m ready for the return to chaos. I’m sure Cliff is, too. And-a One. I packed up the baby for a trip to the UPS store. Transferred his stroller from the van into the car to make it easy to take him in. ‘Cause, you know, I’m a thinka. All the way there, I reached back to tickle his legs and keep him awake; he was on the verge of dozing. After 15 minutes of my hooting and hollering, tickling and poking, we made it. I unpacked the stroller. Unleashed the strapped-in child and managed to maneuver him and his cart through the snow to the sidewalk … only to discover that I left the package I was going to send at home. And-a Two. I returned home, by this time, with a sleeping baby. There was the durn ol’ package just where I left it in the open breezeway between the house and garage. Next to it was a baby car seat that I pulled out of the garage during that brilliant transfer of the stroller. And in that car seat, was a squirrel, who had obviously (at light speed) decided to dig a hole in the cushion to make a cozy home. He scampered, but the (permanent) damage was done. I admit it. There’s something about Taylor Swift I like. Yes, I’ve seen her perform live on TV and well, no comment. But, you can’t deny that she’s cute. All 90 pounds of her with that thar sparkly guitar. As a woman who was once a 90-pounder (without a sparkly guitar), I appreciate those stick-figure legs in some sort of a kindred-spirit kind of way. Her songs are 90-pound sparkly, too. You know. Light weight and a little fun. Not really flashy, though. But here’s what I admire most. Her willingness to tell someone what she thinks of them in a song. Well, I’m not a songwriter, but that’s not the point. So, like Miss Taylor, every now and then, I yearn to dish out just one swift kick. And today is just one of those days. Yes, I know … Please. Thank you. 50% off. Free. Those are all magic. But last night, as I was tucking Henry in we discussed some of the highs of the day. Sledding. Working on a project in the basement. Laundry. Whatta man. Music to a mother’s ears. 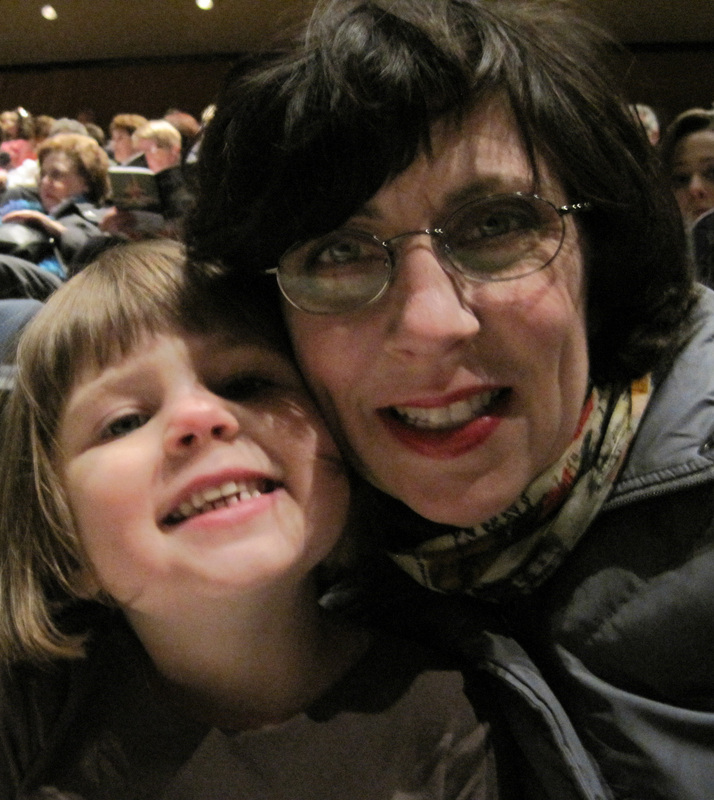 “That was awesome!” Those are Lillian’s words to me after sitting through her first full-length ballet. After two hours of quiet from a girl who talks pretty much incessantly, THAT was awesome. She was mesmerized by whole thing. Tickets to a performance of Swan Lake by the Russian National Ballet were given to us by a friend’s mom. 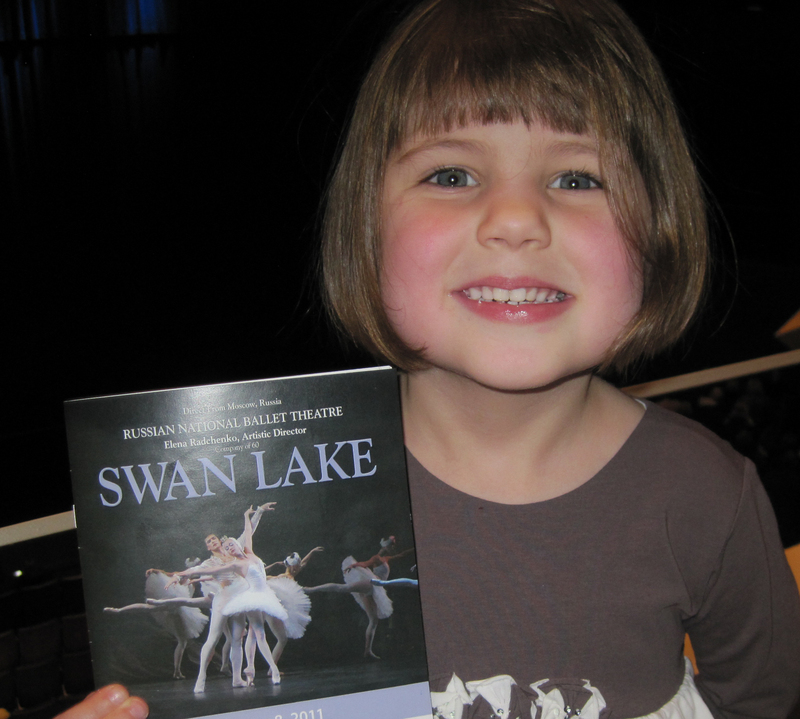 Little did she know when offering tickets to us, that Lillian, at the tender age of four, is a Swan Lake scholar. Her love affair with the story began by chance. It was the music that appealed to her first. After watching the Disney Sleeping Beauty DVD (with a Tchaikovsky sound track), then two-year-old Lillian watched the special “documentary” about the composer that auto-started following the feature. Then came Barbie Swan Lake. (I know, we’re so highly cultured.) But that wasn’t enough. She wanted to hear all the music. So we played it. Then came Swan Lake books and CDs from the library. And then watching clip after clip on YouTube. She would hide behind a chair as she watched the “evil guy.” Critiquing the costumes and sets of the different versions. And as scared as she was at times, she insisted on watching, again and again. On her third birthday, she was gifted with a ballet tutu that has a recording of music from Swan Lake built into it. With a push of a button, her fancy fluffy skirt, and her beautiful imagination, she was transported to that enchanted lake. I don’t think I would have thought of taking her to a ballet at this age. A musical maybe. The other kids were her age for that. But here was this lovely opportunity. We really made a date of it. We shopped for a new dress (thanks to after-Christmas sales). Went for a haircut. (Which she needed—but just added to the excitement of the day.) She ate lunch. Napped. And then it was time to go. Our seats were front-row, center in the balcony. 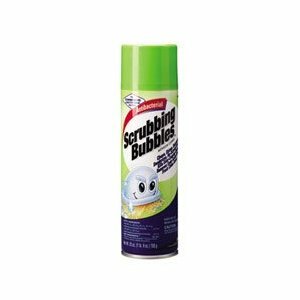 Perfect for a little person. The music began and so did the joy. She gasped at each leap. She occasionally raised her arms in imitation of the elegant and beautiful white swan Odette. Her jaw dropped at the lifts, and she was the first to clap to acknowledge skill. She was never lost in the story and didn’t miss a thing. She grabbed my arm and pointed to make sure I didn’t miss the times when Odette spied the Prince dancing with imposter Odile. And, by the way, the Odette and Odile were fantastic. Odette especially. But more than that, the experience was priceless. I loved it, too. It made me really appreciate the wonder of Lillian. Other than her recent interest in the process of waste disposal and local landfills (don’ ask), she hardly shows much grounding in reality. The same part of her that would hide MC’s video camera because of something she may have imagined, is the same part of her that made her able to enjoy so completely the fantasy world put before her on that stage. It wasn’t about suspension of reality. For her, what she saw was reality. Why wouldn’t it be? Swans dance. Princes spin. Jesters leap, and evil guys try to mess up everything. And her commitment to it all is beautiful. I know that without minds like hers, that kind of creativity and beauty wouldn’t exist, nor would there be a gasping, clapping audience to appreciate it. We should all embrace that part of ourselves a little more often, or at least try once in a while to see the world through the eyes of a child. Mary Claire turned 14 on New Year’s Eve. Not the eve exactly. The day. But, you know what I mean. Richard and I decided to splurge and get her an hd video camera. She loves to make movies and her little camera just can’t keep up with her. We always host a party in her honor on New Year’s Eve. 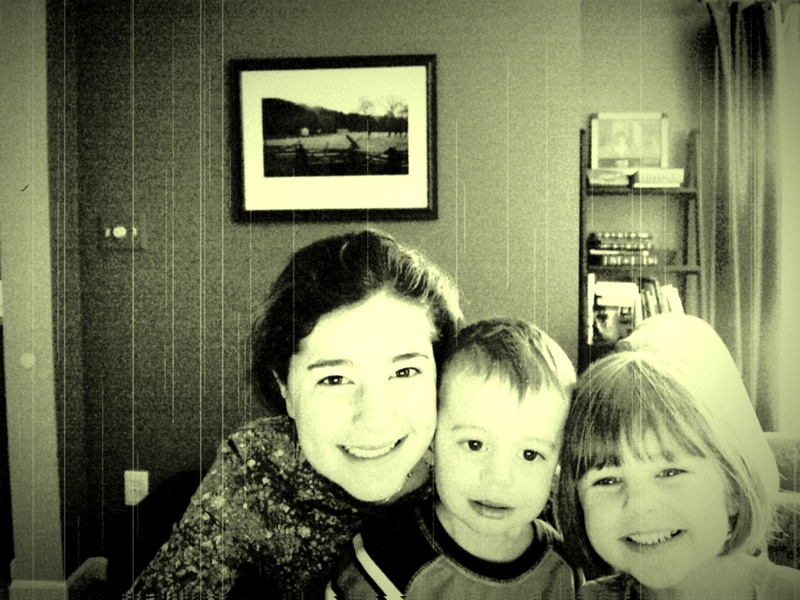 Family. A few friends. This year, no different. Just before everyone was to arrive, we skyped (if that’s even a verb) my mom and dad in Florida. She showed them her camera and a few other gifts. A few minutes later, Cliffy was playing dead. So she recorded him. (It’s hilarious). When it came time for MC to open her gifts, she was thrilled to receive a case for the camera from my sister. She went to gather the camera and it was no where to be found. We wracked our brains. Did Richard pick it up in a last minute tidy before guests? Did Cliffy get a hold of it? Did MC put it somewhere? It was a mystery. We spent a little time looking, but then went back to our guests. I admit. I was feeling a bit like a loser. My house isn’t that much of a disaster. I generally know where stuff is. But somehow, in the course of the party, the TV remote went missing, too. Our house was becoming a vortex for battery-operated items. Lithium ion or AAA. There was no prejudice. We spent the better part of New Year’s day searching for the camcorder and the remote. We stripped beds, emptied drawers. Even went through the garbage. You may remember that my littlest one has a certain affection for the trash can. No luck on either item. Mary Claire suggested a prayer to St. Anthony, the patron saint of lost things and missing persons. Richard said no. This is not lost. Just misplaced. And Richard has a very specific opinion about praying for material possessions. So we kept looking. You know that feeling. It’s maddening. The next day, after church we shared our story with our dear and very tall pastor. He said if St. Anthony doesn’t come through, try St. Expedite. Of course, just the mere fact that there is a St. Expedite was a crack up. When we got home, we started the process of “one last look” through all the places we’d already looked about 15 times. Finally, I said our prayer to St. Anthony isn’t for the misplaced item, but for my sanity, which at the rate we were going was certain to be lost. A quick prayer. “I turned that chair upside down,” said Richard as I reached behind the cushion for the third or fourth time. Lo and behold, I found the TV remote. It was stuck in the folds of fabric. It’s a recliner. Three cheers! But really. Who actually cares about the stupid remote? I wanted to find that blasted camera. That night, as Richard took out the trash for Monday pickup, he checked it all again. Heads were reeling. Mine the most. MC was occasionally drawn to tears. Who could blame her? We had to free ourselves. Sat down for dinner. Watched “Despicable Me. : (Cute movie.) Then started the bedtime routine. Defeated. “Expedia.” I replied. After laughing and being laughed at (which as a parent of two teenagers, is part of the sound track of my life), we remembered it was St. Expedite. We said a prayer. No joke, two minutes later, I’m standing in Lillian and Cliff’s closet, I’d checked all the bins in all of the cubbies, was ready to turn off the light, only to peer over the cubbie unit to see in the maybe 3-inch space between the shelves and the wall, there, in the far corner, was Mary Claire’s camcorder. “Eureka!” I shouted. Because that’s what normal people shout. And I presented the camera to cheers from Richard and MC. But then I pondered aloud. “How could Cliff have done this?” It never made sense that the kid even had his hands on the thing. 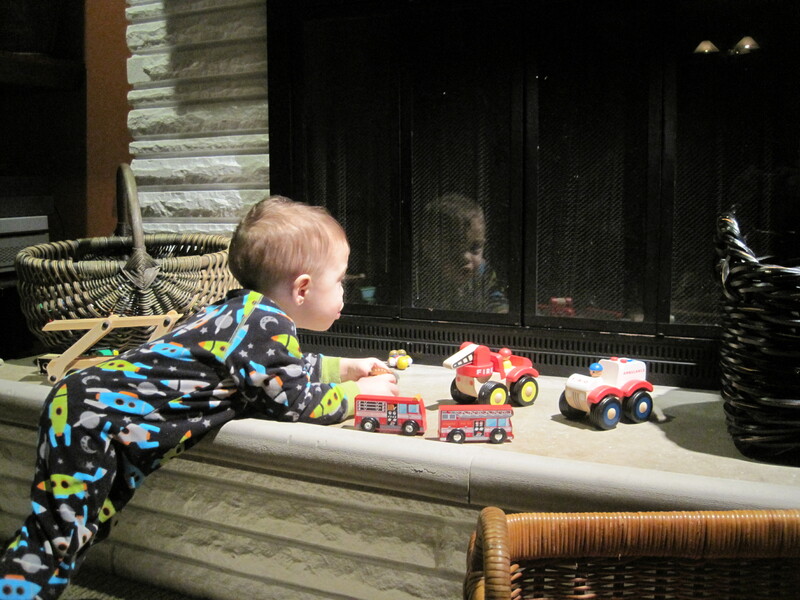 We’re kind of pros at keeping stuff out of his reach – since he throws EVERYTHING. 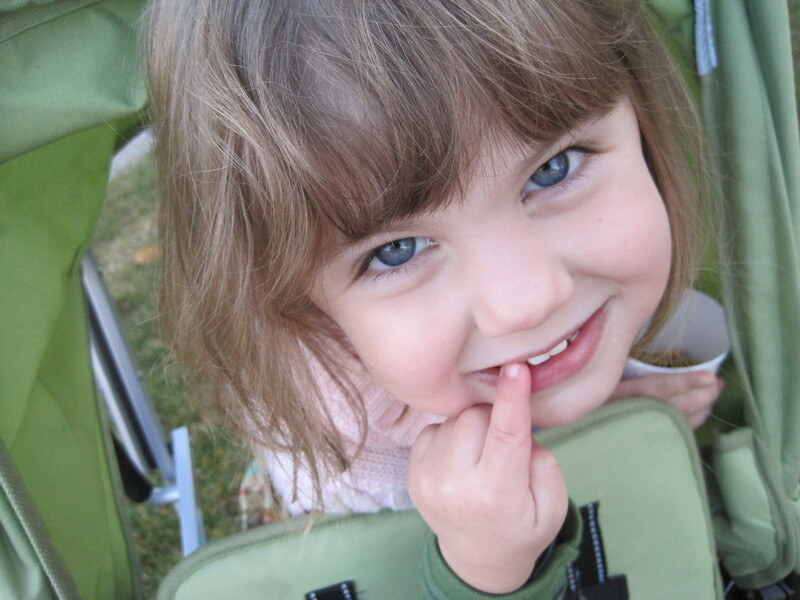 And there stood Miss Lil, who promptly put her thumb in her mouth. Hiding, of all things, a smile. For a flash, it felt like Little Women. When Amy burns Jo’s book because Jo is going to the theater and Amy has to stay at home and do school work. Except the fact that Jo DID actually go to the theater. And Amy DID have to stay home and do homework. So my dear and delightful four-year-old has a vindictive streak that she apparently acts on based on her delusions. Excellent. Well, St. Anthony couldn’t come through because the camera wasn’t lost. It was stolen. So, special thanks to St. Expedia dot com. But after I realized that Lillian watched us for two days tear apart the house, my next question to our pastor was: NOW which saint do turn to for intercession? St. Expeida dot com pray for me!